When three friends wander away from home after receiving cryptic clues of some unknown disturbance in the desert, they invite us into one of the oldest known premises in the movie handbook: the dangerous suburban adventure that alters the lives of youngsters in a world of menacing adults. If a handful of endeavors scattered across the recent past don’t serve as reminders on how popular the concept remains in the scheme of moviemaking, the consider the base implications; a young mind is often starved for a story in which they can affect the outcome of something ambitious and forbidden, especially in the presence of aged superiors that seem to exist for the sake of squandering their passions. Generally speaking, that thought process has yielded some of the unforgettable fantasies of our time – including Steven Spielberg’s “E.T” and Richard Donner’s “The Goonies” – and now, with the advent of new technologies at the disposal of those sorts of unlikely heroes, the potential to expand on the sentiment continues to persevere in the presence of our modern awareness. It’s just too bad that the ambition is seldom matched with stories equally as compelling. “Earth to Echo,” a movie that combines the technique of the infamous “found footage” genre with the underlying narrative values of those aforementioned films, plays like a mere retooling of those prospects rather than a distinctive new spin. Nearly all of the quintessential trappings of the formula exist here dressed up in ambitious visual guises, and the characters engage one another with dialogue that strategically frames their predicaments in the typical elements of childhood sarcasm. Yet as much of a retread it all really is behind those values, there is something almost charming about the fact that any movie in this age of cynicism is so content to spend time in a moment of hopeful inspiration. Clichéd and predictable it may all be, there is no denying the infectious quality of pure optimism. The technique, on the other hand, often wears out its welcome fast, and here is no exception. The story is about three friends – Alex (Teo Halm), Tuck (Brian Bradley) and Munch (Reese Hartwig) – who live in a quaint suburban neighborhood that is on its way to being destroyed by a highway construction going in nearby, inevitably forcing their families to pick up and move away. In the last days of their time together, a collective sentiment sweeps through their imaginations: the need to have one last adventure together before circumstances separate them. The catalyst in that prospect comes when all of their electronic devices begin sending them random and inexplicable signals that look like some kind of defective technical scramble. What can be deduced from them? Alex, a perceptive kid who films all of his adventures with a video camera, believes the electronic pulses are signals from somewhere in the nearby desert, and the three plot a course to hop on their bikes and track down the source. Chaos inevitably ensues. Their search yields the discovery of an alien life form they come to refer to as “Echo,” a small organism that looks like a miniature cross between Wall-E and the maid from “The Jetsons.” Through those obligatory character interactions in which the three kids figure out how to communicate with him, they learn that he was shot down in his small canister-sized ship by some unknown assailant on Earth soil, and has sought the help of others through electronics – his specialty, no doubt – in order to locate the parts he needs to recover from the crash. Of course, this all gives way to even bigger goals when the boys discover during their inevitable scavenger hunt that Echo’s trip is, in fact, an opportunity to rescue an even bigger ship, and the highway construction project turns out to be a military front for troublesome adults who seek to capture the alien lifeform instead of assist it in its goal. It always fascinates me that adults in movies like this are so vehemently antagonistic. The chutzpah of kids dictates that they simply want to do the right thing once their curiosity leads to some sort of amazing discovery, and yet they are often imprisoned in worlds where their aged superiors go beyond the notion of pigheaded misunderstandings. The villainous mouthpiece of the military in “Earth to Echo” is one of the more foreboding of recent memory; almost loathsome in how he creates overreaching threat for those assisting in Echo’s agenda, he recites government rhetoric as if he is reading from the formula pamphlet of vague movie reasoning, and walks through scenes like that game-changing extra you always hear about in “The X-Files.” The supposed excuse: the military believes the big spaceship is capable of causing immense human catastrophe if it takes off, and they intend to circumvent the alien lifeform before it unleashes something potentially horrifying. The problem in these sorts of excuses is usually absent of logic; in this case, Echo himself emerges with such clear warmth and sweetness that there is no inclination to believe he is capable of something so heinous, even accidentally. On the other hand, some of his capabilities with electronic energy are astounding. The film’s most effective sequence – even in context with the inescapable shaky photography – occurs when the boys are fleeing in a truck from the military, and nearly perish in a head-on collision with a big rig. The way that Echo subverts the disaster is a special effect so ambitious that I went back for four additional viewings in order to decipher how it was done. Later, when the boys manage to get their small friend to the site of his giant ship, it leads to a climactic shot that in most movies would be blurred and indistinctive; here, it is given such resounding clarity that we almost forget about the artifice of the illusion, and are left to wonder, once again, what other worlds beyond our own may offer in the way of alien intelligence. 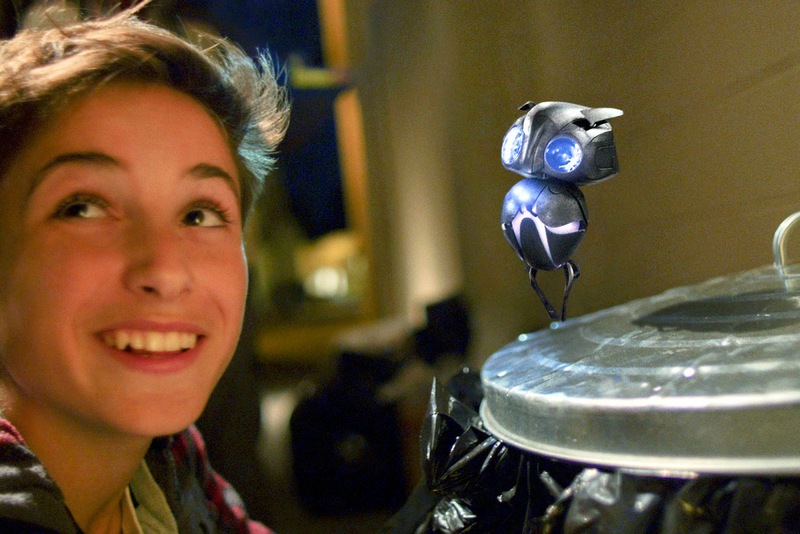 Such details may make “Earth to Echo” sound a lot more rewarding than it really is, however. Momentary blips of inspiration aside, the movie meanders uncontrollably through one cliché after another with very little incentive to hide them behind a novel approach, and the characters are equipped with backstory outlines that are almost obligatory in the makeup of the impending fantasy. It is inevitable, for example, that one of the three boys will be a braniac, or that another will be using his biting sarcasm to mask dark personal realities (in this case: the fact that he is a foster child who feels unloved). And of course another one of the boys will fit the mold of the clever but anxious sidekick who spouts random absurdities for comedic effect, and not surprisingly a girl from school will tag along in the endeavors once she is accidentally made aware of their rather unique situation. The patterns had been long established in the decades preceding this particular excursion, and once you strip away the fact that it is all filmed in a style usually reserved for horror films, little remains beneath other than an acknowledgment that we have already seen all of these details in much better movies before now. That, perhaps, is just a matter of perspective for some. Our minds are trained to spot the parallels – especially if they are used for less profound effect than their sources – and pigeonhole the endeavor with observations that are interlaced with cynicism. The more youthful audience will not share in those sensibilities, either because they haven’t actually seen movies like “E.T.” or simply don’t see the point in wasting the energy. What “Earth to Echo” offers them is an escape from an adult reality that often crushes their desires to fantasize with elaborate absurdity, and takes them into the thick of an adventure that is energetic, colorful, funny, never boring, kind of sweet, and ultimately harmless. As inferior as it may be to the likes of “The Goonies,” I guess a familiar adventure is a lot more preferable to none at all.